Announcement We create wall stories... adventures and characters not just Wall Decals and we design Large Wall Stickers themes to fit any room setup. Our product have been delivered in more than 30 countries around the globe and we made thousands children and their parents happy decorating homes and dozens of offices, childcare places, shops, libraries, churches. You and your little one won't stop smiling looking at Cats Scuba Divers or Space Walking Monkeys or Magical Fairy-Boy or Teddy Bears tricking all around. Our decals are the journeys to imagination and joy, so look for the details of our illustrations - your kids will appreciate! It is fun to deal with our team, easy to communicate even in different languages and we are fast to design custom themes, but be careful, we will make you addicted to our designs :) you'll be back for more again and again. Join the crowd on Facebook, you will see latest updates. We design and made our product in Canada using German Quality Vinyl material. We create wall stories... adventures and characters not just Wall Decals and we design Large Wall Stickers themes to fit any room setup. Our product have been delivered in more than 30 countries around the globe and we made thousands children and their parents happy decorating homes and dozens of offices, childcare places, shops, libraries, churches. Amazing product! 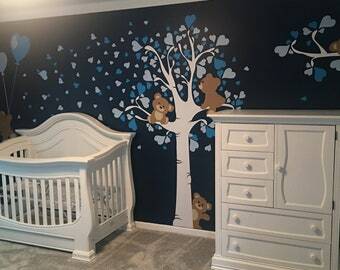 Looks amazing in my sons nursery! Amazing decals!!! Great communication and would definitely buy again! If you haven't seen our Amazon Rain-forests animals set, go check it now! New hit from our illustrator includes jaguar, armadillo, anteater and marmoset monkeys and it would fit perfectly in any nursery decor! More Polar Friends animals in fun Arctic and Antarctic natural environment. Orca Whale, Polar bears, Penguins and Narwhal. Check it out now and get in touch if like to customize it! 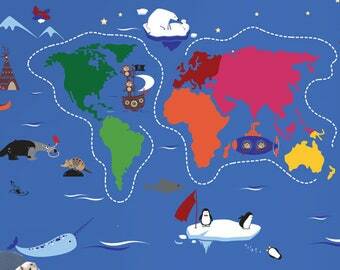 Amazing addition to our collection of Wall Decals - Polar Friends with penguins, bear and whales having fun on icebergs! We are giving away 20% coupon if you buy this item in February! Get in touch with us and ask about it! Not just an image but the whole story, adventure and live characters! I liked drawing very much since childhood, so much that it became my profession. With vinyl wall decals being the latest trend in home decor it was the perfect field to dive into. The warm response to my illustrations and design work eventually allowed me to set up a wall decal studio. Decals are easy to apply, easy to remove, easy to tailor to a specific wall or surface – we offer handmade large vinyl wall stickers with designs and ideas for kids’ and grown-up’s rooms. I start with an idea, a pencil and blank paper and then render our designs digitally for vinyl cutting. Soon after 2010 it became my full time job and engagement. 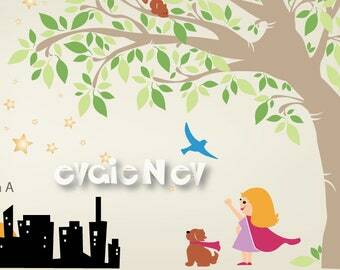 It is a great satisfaction to feel your feedback and design decors for your toddler, nursery, play space or living room! Designer, Illustrator and Art Director with long and successful history in digital printing industry. Graduated from The Art Institute of Pittsburgh. In depth knowledge of educational and illustrative art work production. You are very welcome at our vinyl decals shop. Please read below carefully as we consider this policy as essential part of our production and retail. All our illustrations are created in Canada, ON by professional designers, illustrators and interior specialists. 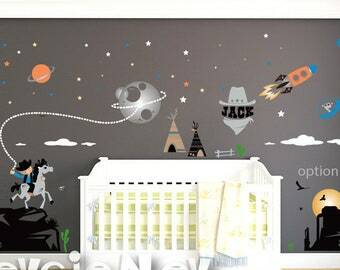 We are obsessed with kids nursery decor but have a variety of other items in our shop. We are happy to hear from you and answer in a timely manner to any questions and concerns please do not hesitate to drop us a line.